[Seven/8:30pm] Desperate Housewives. “Gossip.” Gaby’s engagement party is upstaged by an unexpected announcement. The neighbourhood is full of gossip about the dead body found in a Wisteria Lane home. Susan gets help as she if faced with the hardest decision of her life. [Seven/9:30pm] Brothers and Sisters. “Bad News” Sarah finds it very difficult to get past her husband’s alleged indiscretions with another woman. When Nora fails her writing class, her teacher allows her to pass on one condition – she must go on a date with him. Kitty has to calm the Senator down after a disastrous helicopter crash. Guest starring ROB LOWE. [Seven/10:30pm] Boston Legal. “Brotherly Love”. Alan defends a shady lawyer accused of trying to cover up a murder his brother committed. Brad makes a stand against the firm that could cost him his job. Denny uses The Secret to wish Raquel Welch into his life. 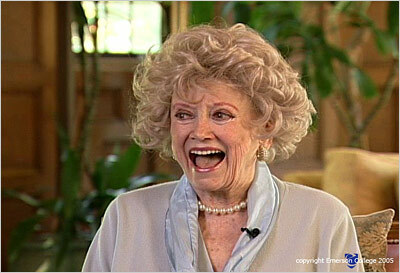 Guest starring Phyllis Diller. [Seven/11:30pm] Scrubs THEIR STORY. In a unique twist, J.D. turns his narrating duties over to Ted, Todd and Jordan and the problems each have to solve. Ted tries to settle a pay dispute between the nurses and Dr. Kelso. Todd thinks he has found his calling in plastic surgery. Jordan messes with Elliot and Keith’s relationship. [Ten/8:30pm] Supernatural. “All Hell Breaks Loose.” Part 1 of 2 part final. [Nine/12:00pm] Movie: On Golden Pond (US 2001) Remake with Julie Andrews and Christopher Plummer. [Nine/7:30pm] What’s Good For You. Final. [ABC/9:30pm] More than Enough Rope. This week: THE PERFECT GUEST: Michael Parkinson. Some guests are so good at the job that Andrew could quietly slip away and the interview would go on just fine. There’s no better example than Michael Parkinson, ably supported here by Antonio Banderas, Mel Brooks, Matt Damon, Josie Jackson, Gerard Donaghy and Glenn and Jane McGrath.